microsoft Archives - Touch Display Research, Inc.
How much will Samsung’s micro LED TV cost? September 10, 2018 By Jennifer Colegrove, Ph.D. 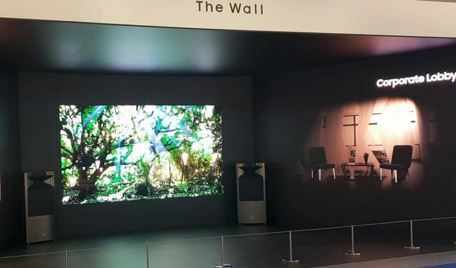 Principal Analyst, Touch Display Research Inc.
After demonstrated the micro LED digital signage “The Wall” at CES 2018, Samsung also showcased The Wall at IFA 2018 in Berlin. Now the rumors suggested that Samsung will bring micro LED TV to consumer’s home in 2019. Now the question is: how much will Samsung’s micro LED TV cost? In the recently published “Micro & mini LED Technologies Supply Chain and Market Forecast 2018 Report”, Touch Display Research Inc., a market research and consulting firm, analyzed all the methods to fabricate micro and mini LED displays along with their supply chains. More than 120 companies and research institutes working on micro LED and mini LED display are profiled in the report. Micro LED and mini LED display could disrupt the whole display industry due to their benefits of high brightness, wide color gamut, low power consumption, fast response time, etc. In this report, Touch Display Research calculated the BOM (Bill of Materials) of micro LED displays for AR/VR, smart watch, smart phone, digital signage/TV. We also compared the BOM of micro LED vs. mini LED displays, compared the BOM of three color LEDs vs. color conversion methods. The cost of Samsung’s micro LED TV is calculated in the Micro & mini LED 2018 report. Based on the BOM calculation, business strategy recommendations are provided in this report. All the methods to fabricate micro and mini LED displays along with their supply chains are analyzed and put into 15 method categories. The “Micro & mini LED Technologies, Supply Chain and Market Forecast 2018-2028 Report” is available immediately. This entry was posted in micro LED, micro LED display, micro LED market report, micro LED report, microdisplay, microsoft, Mini LED and tagged Bill of material, cost, micro LED, micro LED TV, mini LED, Samsung, The Wall on September 10, 2018 by jennycolegrove. 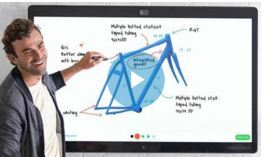 Microsoft’s Surface Hub brought interactive whiteboard to a higher level last year. In October 2016, Google announced it will release 55 inch Jamboard interactive whiteboard to the market in 2017 to compete with Surface Hub. But the Jamboard is still not available yet at this moment. On January 24th, 2017, Cisco announced its Spark Board and joined the competition. Cisco is moving faster than Google: the Spark Board became available in end of January. People can purchase the 55 inch Spark Board right now for $4990 plus a monthly fee of $199. Cisco will release a 70” version in end of this year for $9,990. Touch Display Research believes the Spark Board touch sensor is using metal mesh or silver nanowire transparent conductors. 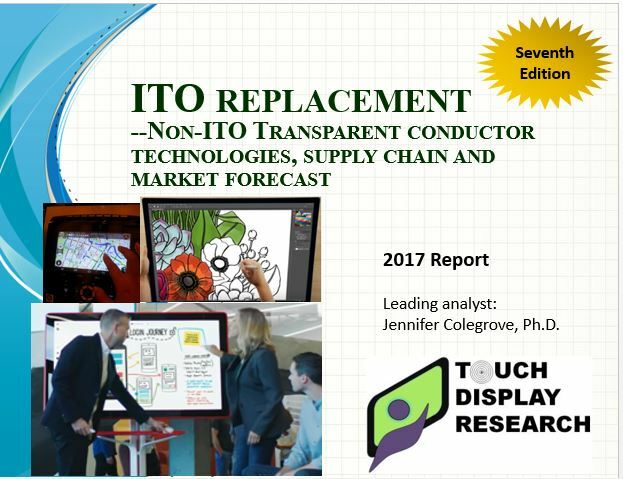 In the ITO Replacement—Non-ITO Transparent Conductor Technologies, Supply Chain and Market Forecast 2017 Report, seventh edition, Touch Display Research profiled over 300 companies and research institutes working on advanced transparent conductive (TC) materials. The report provides a detailed analysis of metal mesh, silver nanowire, carbon nano tube (CNT), conductive polymer, graphene, and other technologies. Our survey found that the ITO-replacement transparent conductive material industry had grown over 10 time from 2012 to 2017. Touch Display Research forecasted that non-ITO transparent conductors will continue to have rapid growth in the next several years. Many companies’ metal mesh characters are compared in one chart in the Excel database, and the silver nanowires of many companies are also compared in one chart in the report. The “ITO-replacement Technologies and Market Forecast 2017 Report” Seventh Edition is available immediately. This entry was posted in interactive whiteboard, ITO replacement, metal mesh, microsoft, Silver nanowire, touch screen, Touch screens and tagged 55 inch touch, Cisco Spark Board, Google Jamboard, ITO Replacement, ITO-replacement market, metal mesh, Microsoft Surface Hub, silver nanowire, touch market on March 7, 2017 by jennycolegrove. This week, Google announced its 55 inch touch display named Jamboard. Touch Display Research believes the Jamboard’s touch screen is using metal mesh or silver nanowire. Touch screen with ITO-replacement is gaining momentum for >50” sizes category. 3M showed 55-inch touch table with metal mesh touch screen. C3Nano demonstrated 55-inch silver nanowire transparent conductor touch display. Microsoft has released their 55-inch and 84-inch interactive Surface Hub that can sense both finger touch and active pen. In the ITO Replacement—Non-ITO Transparent Conductor Technologies, Supply Chain and Market Forecast 2016 Report, sixth edition, Touch Display Research analyzed over 240 companies and research institutes working on advanced transparent conductive (TC) materials. The report provides a detailed analysis of metal mesh, silver nanowire, carbon nano tube (CNT), conductive polymer, graphene, and other technologies. Figure here is the comparison of several transparent conductors. Touch Display Research forecasts that the ITO-replacement market will reach $13 billion by 2023. The ITO-replacement industry has made good progress in the touch panel and other applications in the past two years. However, not all companies are growing and you need to be very selective. The specifications of over thirty metal mesh suppliers are compared side-by-side in one chart in the Excel database. 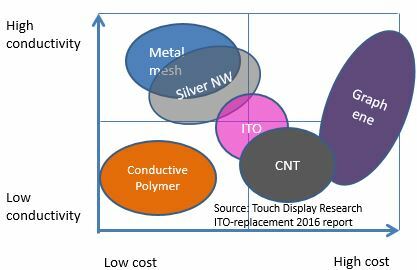 Touch Display Research forecast that ITO-replacement will become the major transparent conductor for touch panels after 2021. ITO will be the minor transparent conductor for touch panels. This entry was posted in Active Pen, Google, ITO replacement, large touch display, metal mesh, microsoft, sensor, Silver nanowire and tagged 3M, C3Nano, Google, Jamboard, large touch screen, Microsoft, Surface Hub on October 27, 2016 by jennycolegrove. At SID 2016 DisplayWeek, Microsoft’s Distinguished Scientist, Mr. Steve Bathiche gave a keynote presentation about the advanced user interface technologies they are working on and his vision for the future. 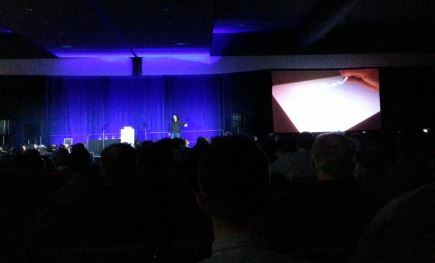 Figure: Microsoft’s Steve Bathiche keynote at SID 2016. Active pen input is very useful in education, certain language input, medical, finance, industry applications, and content creation. In the recently published “Active Pen 2016 Report (Second Edition),” Touch Display Research Inc., a market research and consulting firm, analyzes more than thirteen active pen technologies. Touch Display Research forecasts active pen writing module (includes pen sensor, pen and controller IC) revenue will reach $6.1 billion in 2021, from $2.9 billion in 2016. This entry was posted in Active Pen, Displays, microsoft and tagged active pen, Active Pen market forecast, gesture control, Microsoft, Microsoft Surface, SID 2016 on May 26, 2016 by jennycolegrove.